BINTULU, July 31 (Bernama) — PETRONAS Carigali Sarawak Gas (SK Gas) will collaborate with Bintulu Development Authority (BDA) and Universiti Putra Malaysia, Bintulu (UPM) to transform Nyabau Hill here into a new green lung. 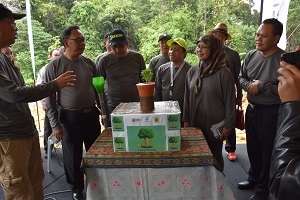 Through this collaboration some 3,000 Hopea Odorata (Merawan Siput Jantan) trees will be planted on a 3-hectare plot at the Nyabau Hill public park from this year until until 2020. (From left to right) Dr Ong Kian Huat, Director of University Agriculture Park and Development, Universiti Putra Malaysia, Bintulu Campus; Tuan Haji Ismail bin Ithnin, Deputy Director General, Department of Environment, Malaysia; Jack Aman Luat, Resident Officer of Bintulu; Morris anak Mail, Senior General Manager of PETRONAS Carigali Sarawak Gas; Rodziah Morshidi, General Manager of Bintulu Development Authority and Mohd Hidzir bin Bakar, Director of Department of Environment, Sarawak, at the launch of Trees4Life.